Connect ULINKpro to the board's Cortex Debug connector and to the host computer. Configure µVision to capture Serial Wire Trace data. Open the dialog Options for Target — Debug. Enable Use, select ULINK Pro Cortex Debugger, and click Settings to open the Target Driver Setup dialog. 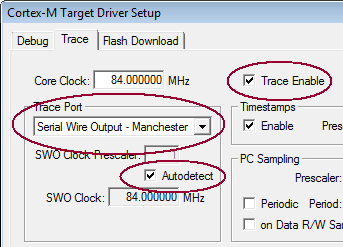 Enable SWJ and select SW.
Set the Trace Port to Serial Wire Output - Manchester and enable Autodetect. The Core Clock must correspond to the device configuration. Start the debugging session and verify the captured trace data with a µVision window.